We Drink Your Milkshake! : Paul Review-He Said! 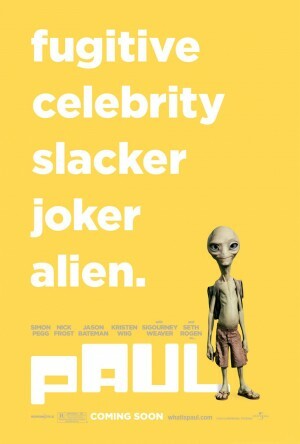 Starring: Simon Pegg, Nick Frost, Kristen Wiig, Jason Bateman, and Seth Rogen as Paul. Synopsis: Two best friends from England come to the US to attend San Diego Comic Con and see the most famous alien landmarks. Along the way they pick up an actual alien. Hilarity ensues. Two questions: are you nerdy and are you religious(ly uptight)? If you said yes and no, then this movie is for you! At this point, I'm pretty comfortable with how nerdy I am. Shocking, right? And I'm glad that there are those people as Simon Pegg and Nick Frost that have been steeped in this culture making movies about people like us. I'm not talking about that annoying trendy "G4" sort of nerd; I'm talking about the real ones. I feel that Pegg, Frost, and director Greg Motolla have made a movie that feels as much of a love letter to geekdom and nerds as director Edgar Wright's movie SCOTT PILGRIM VS. THE WORLD was. The story begins with an awesome recreation of San-Diego Comic Con. If you read Elisabeth Rappe's set report, you'll know that a lot of time and care was taken into recreating what has now become the overstuffed geek event of the year. The minute you meet Greame (Pegg) and Clive (Frost) you can tell that they are not acting in these scenes of wandering around the Comic-Con floor room. The first 20 minutes of the movie are nothing but geek fan service, and I swear there should be a medal if you can spot all of the references to all of these classic nerdy franchises. Once you actually starting getting into the road trip part of the movie, that's where Pegg and Frost's relationship from so many years ago begins to show its benefits. Their chemistry is really loose and feels like two friends hanging out, but not in that annoying way that Adam Sandler/GROWN UPS sort of way. The scene where the duo find Paul is pretty hilarious, and it's weird to see such a good sense of chemistry with two guys and an CG alien. I do have a personal complaint about this movie, and maybe it's not so much the movie, as it is the culture which we live. Throughout the movie, almost up until the end, you get various characters always questioning Clive and Greame on whether they're gay. This annoys me to know end, and it's like all of the sudden because homosexuality is being accepted more, two dudes can't just be friends? That's ignorant, and from a writing point of view, it's a lazy way of writing in jokes. By the time they get into introducing Kristen Wiig's obvious romantic interest character, the movie gets in to some pretty interesting place. You see, Wiig's character, Ruth, is a fundamentalist Christian, and when she encounters Paul, the movies gets pretty philosophical. What would someone that has a strict definition of the Bible in their mind as the ultimate truth do after meeting an alien? I know this sounds very controversial, but seriously get over yourself. It's interesting because when you see this movie, you will see two very opposing points of views regarding this question. I feel this was a bit of a risk to take, but it's one that it serves the comedy of the movie, while also making the movie have a bit more weight than just another road trip movie. The little green guy is obviously the catalyst of this movie, so how does he hold up? Surprisingly well actually. Apart from one flashback scene, you pretty much forget that he is not real. I really expected Paul to be like Mike Myers' Cat in the Hat character where you could not ever get into the movie since Myers kept on switching between Shrek, Austin Powers and whatever idiotic character he has portrayed before. Plus, I remember not being too impressed with his work in MONSTERS VS. ALIENS, I will admit I was very negatively biased towards having Rogens' voice in this movie. But, there's something to the character of Paul that Rogen's voice compliments. Mind you, we're not talking Gollum levels of realism, but it's pretty close. I'll also mention that as supporting cast members Jason Bateman, Bill Hader and Joe Lo Truglio were pretty plain. None of them are not going out of their range. Bateman especially needs to get way from the uptight proper white guy routine he has done since the Arrested Development days. A really frustrating thing about PAUL is that it has a tendency of having too many plot points going on at the same time. The amount of "bad guys" chasing them goes up to five at one point in the movie. It's too much, especially when you consider that some issues are resolved in the most lackluster sort of way. They could have pared this down and made the movie a lot leaner and it would've benefited greatly from it. I realized after finishing the movie that it really is more about the relationships. The friendship between Greame, Clive, Paul and Ruth is what holds this movie together. There is enough conflict and differences to keep it interesting, and there are enough nerdy references that only make the movie a bigger joy if you're a part of that culture. This is probably the best movie I have seen in theaters this year so far. So go see it now nerds!